Blogger Sign Ups Are Now Open! It’s time for another fun giveaway hosted by Mom Loves 2 Read! 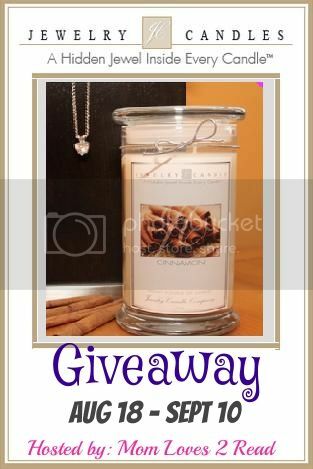 This time we are giving away a Jewelry Candle and a bag of Jewelry Tarts to 2 lucky winners! Please read these simple guidelines below and then use the form (link at the bottom of this post) to sign up. **Must have a minimum of 500 facebook or twitter followers for FREE link option (facebook or twitter only) - if you have less than 500 followers, then you are welcome to join for $2 for your first link. **You MUST post the giveaway by noon on August 18th or all links will be removed. If you have a problem getting your post up on time - email me immediately - I understand that occasionally life gets in the way! You may pay $2 per link if you would like them to have more entry value and be near the top of the giveaway form or on the first host page. - please make sure to include a comment when paying about extra entry value. Boost Your Alexa, GPR and daily visits by hosting a page or becoming a cohost! **Co-Host spots (4 available) are $15 each and include 2 additional free social media links, backlinks on all participating blogs, plus a host page. ** there WILL be a Referral prize! So make sure to promote this Event Sign up as much as possible - One Blogger who refers others will receive $10 via Paypal OR Amazon GC! Also, please add to the post info or rewrite some of the working in the post HTML for SEO purposes (to make your post unique), but all the basic information and the pictures and links need to remain intact. The sponsor links must remain dofollow for the duration of the giveaway - you may nofollow or delete once the event has ended! The event will run from August 18 12:01 am through September 10th 11:59pm. Participating bloggers ARE permitted to enter the giveaway! Participating bloggers will be asked to promote the giveaway at least 1 time daily on at least 1 social media (facebook, twitter, pinterest, etc) during the course of the event. A few ways to promote are on facebook, facebook groups, giveaway link ups, twitter, google+, linkedIn, pinterest, instagram, and so much more! Since this is a group event, everyone has to do their part for it to work! Payment information ~ Fees may be paid via Paypal or Amazon.com egiftcodes sent to MomLoves2Read@itv-3.com If paying with Paypal - YOU are required to pay all paypal fees yourself otherwise you will not be paying the full fee for this event -if you have existing funds in your paypal account, or a verified bank account - use the "gift" option for no fees (i think). Otherwise you may choose to send Amazon.com egiftcodes and then no extra fees are required. Ready to participate? Then SIGN UP HERE!